Wednesday, November 12th, 2008 | 12:18 pm	and filed in Music, Friends. My friends in The Invisible Cities are putting the final touches on their new album, and they let me sit in on their mastering session. The Cities contracted the services of Mike Wells, who has a room in the Hyde Street facility in San Francisco. Even though I’ve contracted Mike for a different project, this was the first time I had a chance to see him work his mastering magic. Mike’s setup is loaded with some killer analog gear including a Pendulum Limiter, GML 9500 and 2030 ::angel choirs sing::, and he uses the Dangerous Master transfer system at the core of his setup. 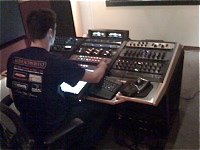 What was really interesting was to see his use of various devices to color the sound with a mix and match of tube and discrete processing on the Mid-Side channels. Mike is certainly an artist when it comes to shaping the final sound of an album. I did learn quite a bit at this session, and Mike is great at explaining the process and pointing out issues. His site is also features some articles about the process of manufacturing CDs and sorting out grace note CDDB information. It’s certainly worth a visit if you’re thinking about properly finishing your album. I encourage everyone to read his articles on CD Mastering Explained, and Is Your Audio CD *REALLY* Redbook Quality?